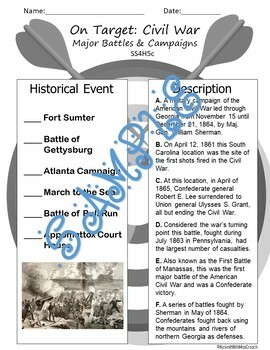 This one - Page Social Studies matching worksheet is a perfect filler at the end of a unit or for early finishers. Students love match-ups! This simple worksheet can be a fun way to introduce many of the terms a student will encounter in class during your social studies unit. ✔Great activity for your sub folder! SS4H5 Explain the causes, major events, and consequences of the Civil War. c. Identify major battles, campaigns, and events: Fort Sumter, Gettysburg, the Atlanta Campaign, Sherman’s March to the Sea, and Appomattox Court House.